Tags: Antique book, Asia, Malay, Singapore. Portfolio Malay Peninsula: Old Photographs of Malaya and Singapore by C.J. Kleingrothe. 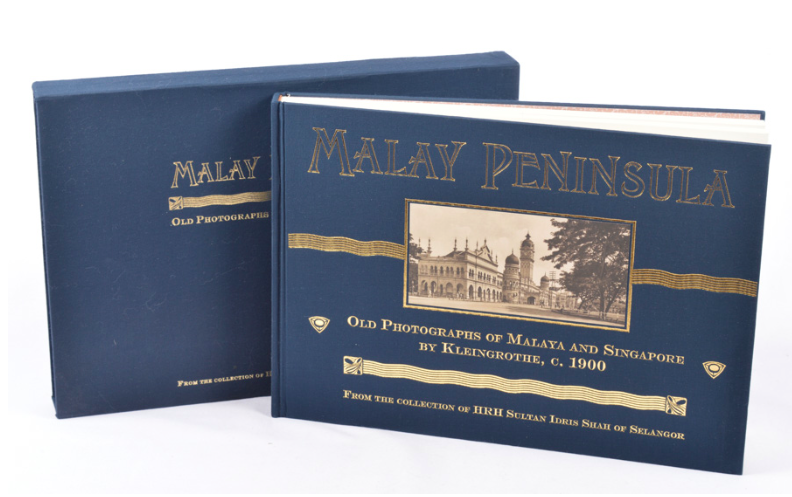 Little biographical information has come to light about the elusive Charles J. Kleingrothe, the photographer whose images of the Dutch East Indies and British Malaya are now highly sought after collector’s items. In the late 1860s, Kleingrothe worked for G.R. Lambert & Co., a leading photographer of Singapore whose prints had been compiled in a similar though less sumptuous volume years ago. When the plantation economy of Sumatra flourished in the latter half of the 19th century, G.R. Lambert opened a branch of its studios in Medan in 1888, then part of the old Deli Sultanate, for which Kleingrothe was put in charge. His pictorial record of Sumatra plantations of the day are unrivalled and was probably one of the few sources on this largely-forgotten phase in the history of the island. When the Medan branch declined and was subsequently wound up during the Great War in 1916, Kleingrothe too seemed to have disappeared without a trace. Now comes this magnificent tribute to Kleingrothe’s genius and eye for detail, made possible when HRH Sultan Sharafuddin Idris Shah of Selangor – a long-time patron of the MBRAS – graciously consented to making his copy of Kleingrothe’s peerless portfolio, Malay Peninsula: Straits Settlements & Federated Malay States , published in 1907, once more accessible to the general public. This edition, however, reproduces only 139 of the 175 photographs that originally appeared in the collection, along with a new set of captions to elucidate the subject matter of each image which also includes the original captions as they appeared in Kleingrothe’s portfolio. Its original, now no doubt an item of remarkable rarity, took the form of a boxed portfolio containing a title leaf, colour map and photogravure reproductions set down on 72 loose leaf folios.